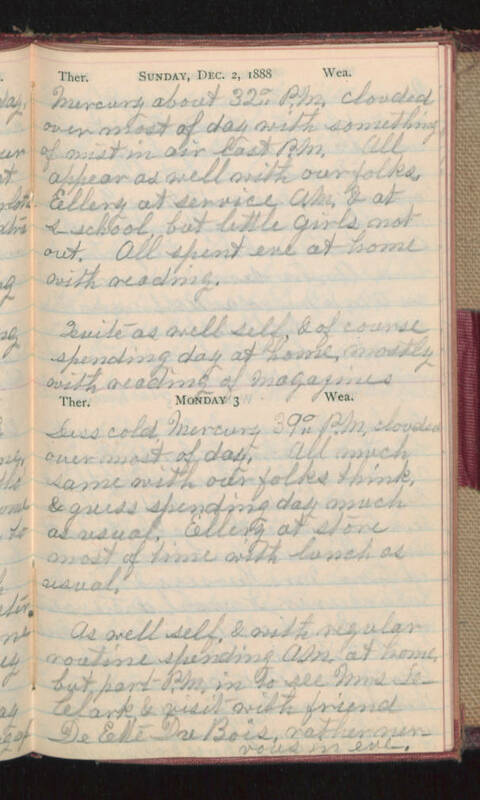 Sunday, Dec. 2, 1888 Mercury about 32° P.M. clouded over most of day with something of mist in air last P.M. All appear as well with our folks, Ellery at service A.M. & at s-school, but little girls not out. All spend eve at home with reading. Quite as well self, & of course spending day at home, mostly with reading of magazines. Monday 3 Less cold, Mercury 39° P.M. clouded over most of day. All much same with our folks think, & guess spending day much as usual. Ellery at store most of time with lunch as usual. As well self, & with regular routine spending A.M. at home, but part P.M. in to see Mrs LeClark & visit with friend DeEtte DuBois, rather nervous in eve.